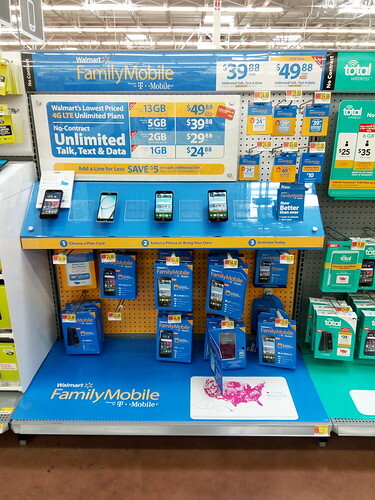 This shop has been compensated by Collective Bias, Inc. and its advertiser, Walmart Family Mobile. All opinions are mine alone. #SummerIsForSavings #CollectiveBias #WFM1 All prices for phones and plans included in this post are accurate as of the date of posting; however, these prices are subject to change. Please refer to this page or your local Walmart for current pricing. Who’s ready to bonfire?! I’ve already done a record of three bonfires this summer and it’s only June! 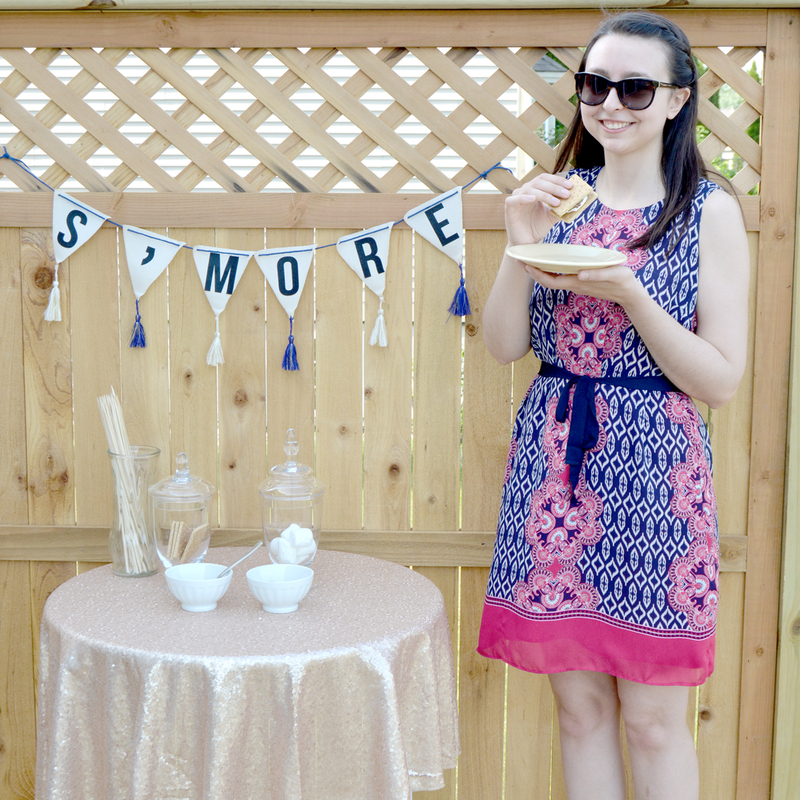 I live for summertime s’mores, there’s just something so satisfying about the perfectly-roasted marshmallow, situated between a delicious square of chocolate and the finishing crunchy graham cracker. 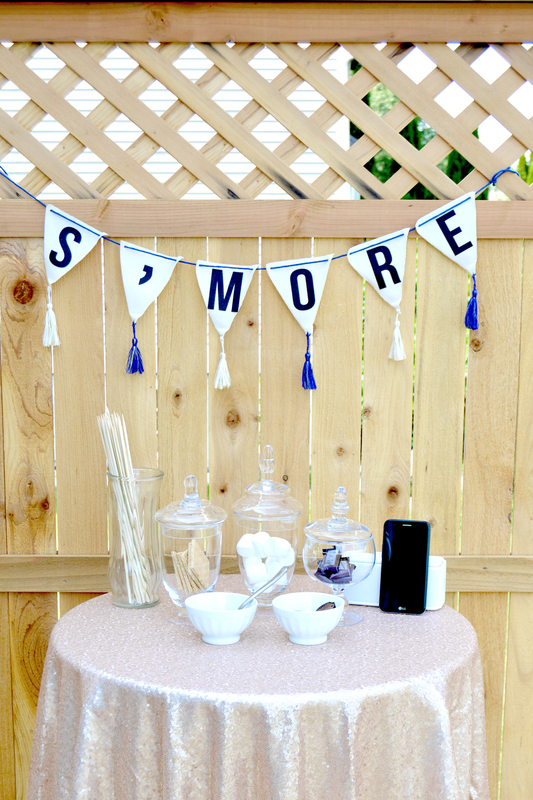 Like I said, nothing beats a bonfire s’more! I’ve been trying out a few bonfire hacks to take my get-togethers to the next level because of course, it wouldn’t be a bonfire at my place if I wasn’t trying to go over the top! 1. 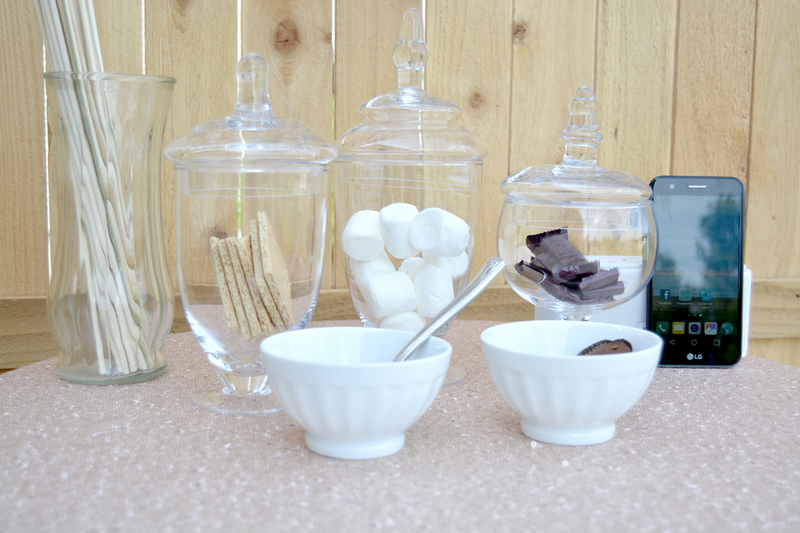 Get multiple toppings going – I love to set up a little “toppings station” and get creative! 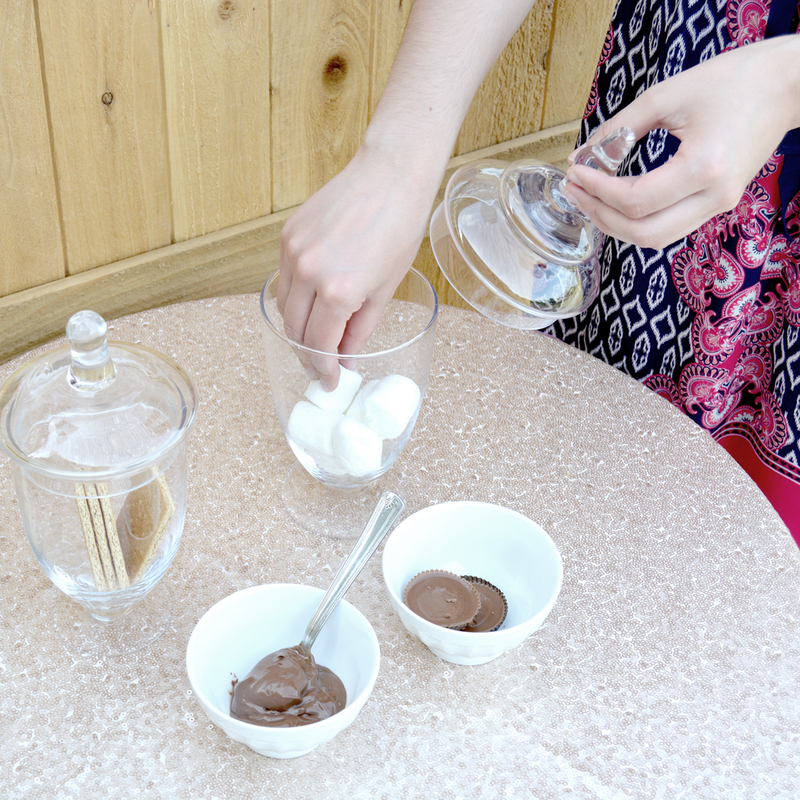 Set out some s’mores mixings like hazelnut spread, peanut butter cups, strawberries, caramel, you name it! 2. Put on some beats – I always set up two or three bluetooth speakers around the deck or the yard so I don’t have to turn up the music really loud in one location – it’s like surround sound for your back yard! 3. Project a movie – portable HD projectors are pretty affordable nowadays (around $100) so we love to tack up a sheet or project a movie onto the privacy wall of the deck while the fire is still burning. 4. Set up remote activated candles – it was still light out so we didn’t need to set them up, but I like to use remote activated candles around important areas, like the step to the sliding door or around the food station, just as a safe way to keep important areas lit throughout the night. 5. Get yourself a good data plan – I love to blast some beats during bonfires but my wifi doesn’t stretch all across my yard outside very well. I’ve been relying on my data plan from Walmart Family Mobile, powered by T-Mobile: the $49.88 PLUS Plan = Unlimited Talk, Text, & Data which includes up to 13GB of 4G LTE† then 2G* plus a free VUDU◊ movie credit every month ($7 value) per line for $49.88. I’ve been streaming music through my new LG Grace which makes it perfect for bonfire entertainment. Powered by T-Mobile’s nationwide 4G LTE† network there’s no contract, no activation fees and the best part is I get a free VUDU◊ movie rental credit valued at $7.00 each time I renew my service. This is a great way to budget for the summer because I can do a lot of music streaming and gif sharing during bonfires without having to worry about running up my service bill because I do a lot with 13GB! >Who’s ready to “have s’more”? 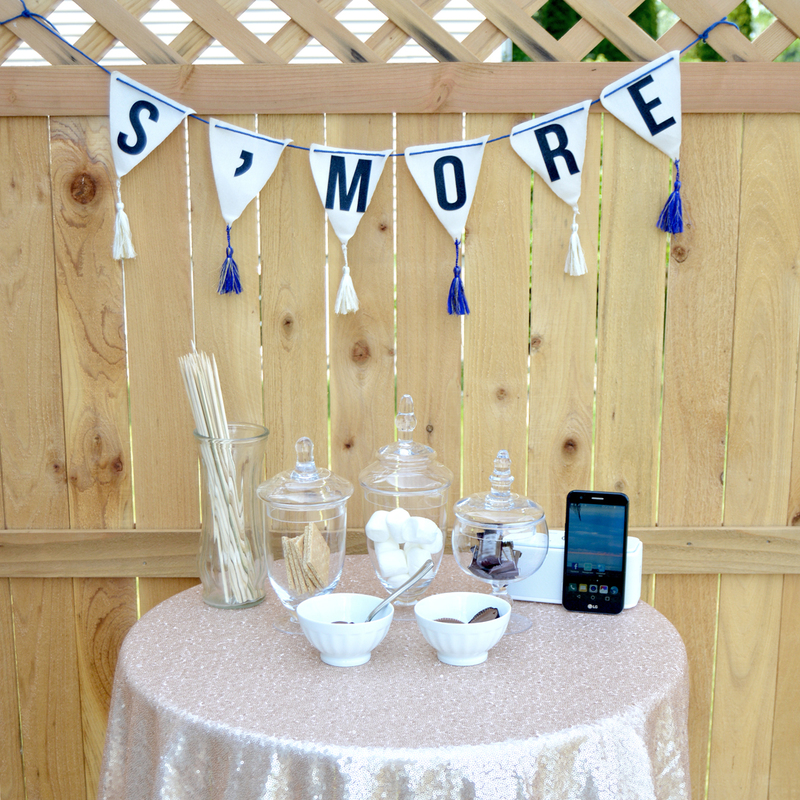 That goes for both the delicious bonfire treat and your data plan! I’d love to know, what are some of your favorite bonfire hacks? And don’t forget to check out more summertime tips and tricks here. ◊Limited time offer. Available for lines active with the PLUS $49.88 plan only. VUDU enabled device and account required for digital viewing. Customers must be 18 years or older to open a VUDU account. Movie rental only available in the USA. Free movie rental provided in the form of a movie rental code to the value of a $7.00 VUDU credit. Must be used within 30 days of receiving code. Offer is non-transferable. Limit 1 per customer. Additional terms and conditions on VUDU’s website: http://www.vudu.com/termsofservice.html. Movie rental code allows for selection from available movies for rent. May not be readily redeemable on all new releases. Code will be delivered within up to 24 hours of the effective account renewal date. Father's Day Gifts for Dads Who Don't Want "Anything"